Whether you’re a hobbyist or a professional drone operator, the concept of a no-fly-zone is something you would have encountered pretty early on. NFZs are found around airports for obvious reasons of airspace safety, but they also cover military installations and other sensitive zones where privacy is an issue. As drones grew in popularity, civil aviation authorities (CAA) around the world began to communicate more frequently and directly about no-fly-zones. Some CAAs released a custom mobile application (USA FAA’s B4UFLY), while others stuck with paper handouts (which made it more difficult to figure out if you were actually in a no-fly-zone). Against the backdrop of this data patchwork, various data curators and application developers rushed to offer their own version of a no-fly-zone lookup tool, with mixed results. In 2014, MapBox began publishing a NFZ layer on their maps. That NFZ layer is no longer available. In 2015, DJI announced that an upcoming software update would prevent their drones from taking off in a NFZ. Unfortunately, they had a very limited set of NFZs in the database. In 2016, AirMap stepped up, aiming to be the master data provider for NFZs. Lacks official regulator blessing: Regulators tend to publish updates to NFZs in their preferred format (often a PDF) on their own website, and in Notices to Airmen (NOTAMs). All of these documents have to be ingested, interpreted and digitised into machine-usable data (in order to be served via an API). If push comes to shove, the regulator’s published data will always trump the NFZ database from an external data provider or drone manufacturer. Does not account for local by-laws: While civil aviation authorities have jurisdiction over airspace matters, other local authorities may enforce additional rules. Local government policies may create additional rules that aren’t captured in the one-size-fits-all data model of the external data provider. Focused on US/China: Most external NFZ data providers are, at the end of the day, startups, and will naturally focus on getting accurate data for their home countries. At the moment, this means that the most detailed sources of data available still focus on the US and China; it takes time to build up a global NFZ data collection operation. As a licensed drone operator in Singapore, we encounter NFZs on a daily basis. This is an urban, highly built-up country with 5 airports (2 of which run 24/7), several restricted and danger zones, and numerous skyscrapers and tall residential blocks. A typical public housing apartment block rises 25-40 floors – the recreational flight altitude limit is 60m (200ft) – just about 20 floors high. 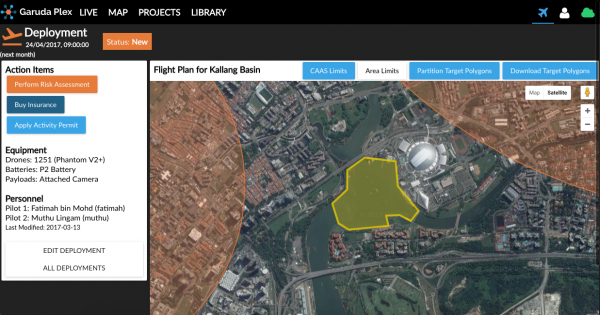 Accurate and up-to-date NFZ data is required when planning every test flight and training session, and certainly when applying for an Activity Permit from the Civil Aviation Authority of Singapore (CAAS). Our initial approach was to use a combination of regulator data, drone manufacturer NFZ data and ground survey data to create an in-house map of all NFZ in our areas of operations. 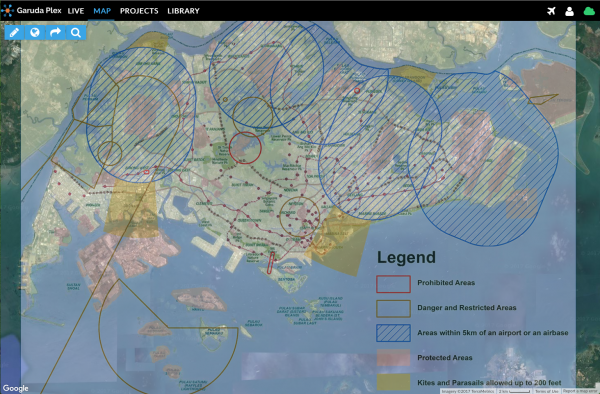 This map included NFZs stipulated by government agencies such as the National Parks Board, as well as high-rise buildings and trees (in particular, gazetted heritage trees in Singapore parks). Based on this obstacle map, we could plot out safe paths to carry out our flight missions. This was a laborious and error-prone process, but was the best option at the time. You’ll notice that the low-resolution image created thick, ambiguous NFZ boundaries once you started to zoom in closer. 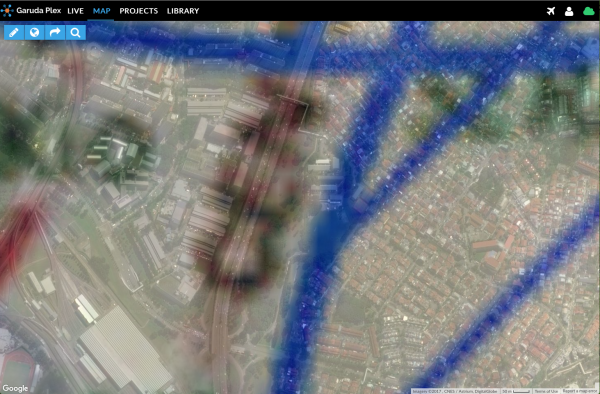 It wasn’t until late 2016, when the Singapore Land Authority was running OneMap 2.0 beta, that CAAS finally published the NFZ data as map polygons. 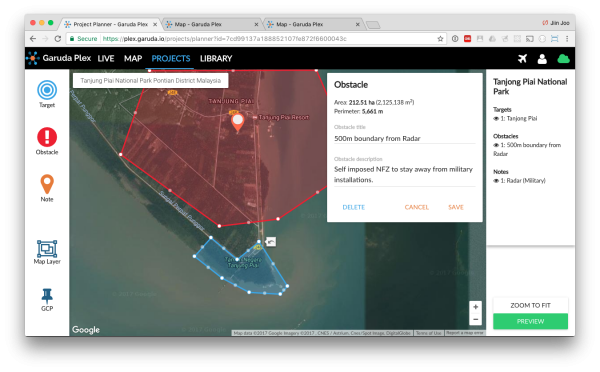 If you’re developing a no-fly-zone app, sign up for OneMap here: OneMap docs. http://www.dji.com/flysafe/no-fly Wow, not not even close. 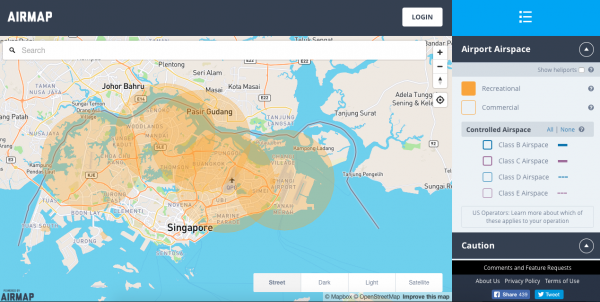 http://www.dji.com/flysafe#regulatory-links contains a hand-waving link to Singapore’s website and Indonesia’s circular, but ignores other Southeast Asian countries entirely. https://app.airmap.io Better than DJI, but still not right. Let’s focus on the NFZs around aerodromes – drones aren’t allowed to fly here because the airspace is in use by airplanes during takeoff and landing. AirMap automatically defines the aerodrome NFZs as circles (well, cylinders if you consider the vertical dimension as well). Many apps and data providers adopt this shortcut for speed and convenience. However, this NFZ shape is only correct in countries where the law stipulates aerodrome NFZs as being “x distance from the center of the facility”. 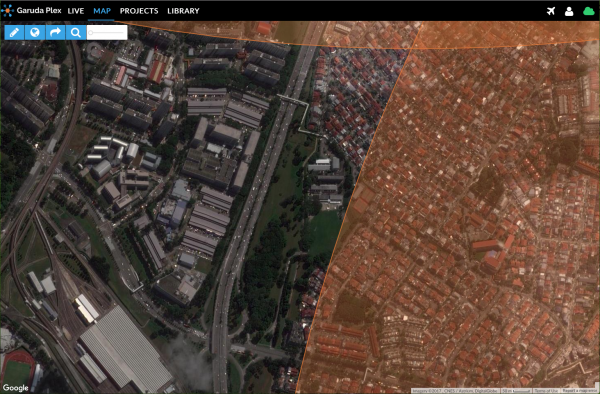 In Singapore, aerodrome NFZs are 5km (not 5 miles) from the boundary of the facility. As a consequence, all the aerodromes are represented as irregular polygons, not simple circles. The Changi Airport aerodrome grew recently due to the introduction of Terminal 4 and additional runways, resulting in an expansion of its associated NFZ. It would be trivial for these data aggregators to consume the CAAS NFZ information via the OneMap API, but they aren’t doing it. Meanwhile, many hobbyists and new pilots continue to trust the outdated NFZ data built into their drones. 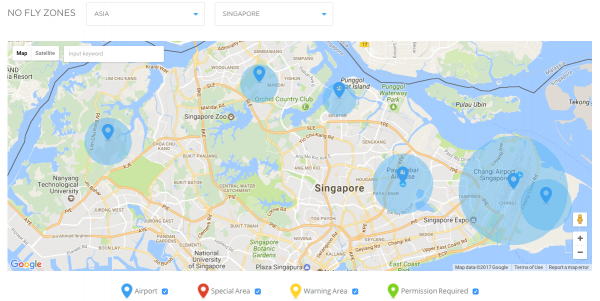 Not many governments have a data infrastructure as advanced and open as Singapore’s. We lucked out in this scenario: First, an agency (CAAS) has to be wiling to publish programmatic data; next, another agency (SLA) has to be willing to run a high-availability API server feeding that data freely to non-governmental users. We spend a significant amount of time providing services to customers in the Southeast Asian region, where no two countries have the same drone regulations. Aerodromes NFZs: In the Philippines, Part 11 of the Philippine Civil Aviation Regulations (PCAR) states that you cannot fly 10km (not 5km) from the Aerodrome Reference Point (ARP, the geometric center of all the usable runways in an aerodrome). Altitude limits: While Singapore’s limit is 60m Above Mean Sea Level (AMSL), Malaysia’s limit is 120m AMSL, and Indonesia’s is 150m Above Ground Level (AGL). This has the effect of legally permitting drone flights on Mount Kinabalu (Malaysia, 4095m AMSL) and Mount Rinjani (Indonesia, 3726m AMSL), but not on Bukit Timah Hill (Singapore, 164m AMSL). (Note: Mount Kinabalu’s airspace is a restricted zone (WER525), so please obtain permission before flying there). There are many other parameters that need to harmonised across national boundaries, such as exemptions that apply to small recreational aircraft, and the rules on restrictions for camera-equipped drones. While the International Civil Aviation Organization (ICAO) is in the process of creating standard regulations for its member states, these will take a long time to ratify and implement. For the foreseeable future, drone pilots will still bear personal responsibility for knowing the no-fly-zones that apply for their location and circumstances. Garuda Plex allows a drone operator to avoid guesswork by actively marking new obstacles and no-fly-zones over and above those which are provided via external data sources. Obstacles at a given location only need to be marked once in a project, and will be available for each deployment. In cases where the NFZ provider lacks reliable data, you can choose to mark all no-fly-zones in the vicinity as obstacles. At the same time, you can err on the side of caution by creating your own polygon outside the officially marked area as a buffer zone and to cater for contingencies. After planning your targets to avoid the marked obstacles, you should get good polygon files that can be loaded into Mission Planner or a GCS of your choice. We’re working on supporting more GCS options and exporting geofences as well. Do you need more layers of data integrated into the map utility on Garuda Plex? Let us know through this survey: https://goo.gl/forms/Pk7Xz9BNTZKTsJJy1. It’ll take you at most 10 minutes. We’ll be randomly selecting 10 survey respondents to receive a free 6-month subscription to Garuda Plex (worth $90)! Survey closes on 31 March 2017.